The Trump regime has formally shifted positions and backed a legal effort to strike down the Affordable Care Act (Obamacare) in its entirety, but don't worry -- Office of Management and Budget (OMB) director Mick Mulvaney says no one will lose their coverage if their effort succeeds. Although Republicans have never successfully passed an alternative health care plan through Congress over the past 8 years, Mulvaney appeared on ABC News yesterday morning where told more than a few lies. [With] no clear GOP replacement plan, Mulvaney provided few details on how he could make such guarantee. It is not actually true that plans supported by Trump would cover pre-existing conditions. In fact, none of the plans considered by congressional Republicans or supported by Trump would have guaranteed coverage for pre-existing conditions. Each of their plans would have allowed insurers to charge any price they like to cover sick patients with pre-existing conditions, meaning coverage would become so prohibitively expensive it would be the same as though the coverage weren't available. Republicans defend this position by saying their plans would guarantee "access" to health care, but what they don't like to publicly admit is that only the rich would actually have "access." In any case, Republicans haven't even been able to pass their own plans through both chambers of Congress and they no longer control the House of Representatives. I'm sure it goes without saying but, if Obamacare is struck down as the White House wishes for it to be, it will be a human and economic catastrophe. Millions of people would simultaneously lose coverage through expanded Medicaid programs and that would ripple through the economy as hundreds of billions of dollars of economic activity vanishes. Mick Mulvaney is technically correct, since the Trump White House has to date put forward zero healthcare plans. As for R plans Donald Trump publicly supported (usually for a short time, before he changed his mind and opposed them), none did either diddly or squat for, well, anyone who needs health insurance. Of course, none of this has anything to do with health insurance per se. It’s part of the ongoing R crusade to erase Barack Obama’s presidency from history. It is like a stock broker telling a client that they have never lost money on a deal. What they aren’t saying is that even if they lose the client’s money they still get paid. 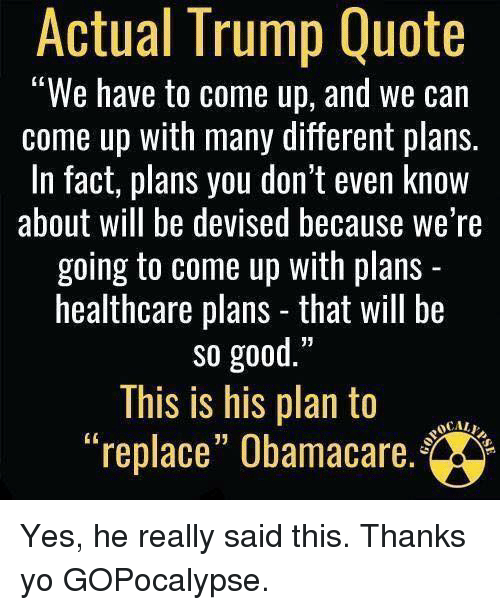 And Trump truly believes what he described there *is* a plan. I am so so so sick of all the bad faith. People just lie and misrepresent and spin and whitewash and did I mention lie? Can you imagine how awesome it would be if both parties simply stated their positions honestly, with an honest assessment of the likely ramifications? Why aren’t they called out immediately for the lies and hypocrisy? Rump is now over 22 lies a day..that’s pathetic..we don’t hold presidents accountable for anything anymore? I’m confused why the Retrumplican Party (AKA Grifting Openly Party or GOP) thinks this is a winning position. Din’t they have their asses handed to them in the mid-terms over this very question? sadly they think the “Barr book report” will save them. They did. But they also know that they lost by close margins in many races. If it is close enough to steal, the gop will steal it. It is that simple. They don’t really care what the public has to say about anything. They are looking to be immune from any kind of political backlash or public outrage at what they do. This is why they lie so much. As usual, it is all about their donor base of corporate support and the ultra rich. They figure they can intimidate or pull the rug over everyone else’s eyes. Turnout is the key. Bury these fffffers.